A lot of our brides want a Bollywood Engagement shoot or even a Bollywood wedding.. but not many are as serious as our bride Pooja Thaker. And to add the ‘Love Tadka’ in her life…came her prince charming, Sidharth Pande, to make her life all the more romantic and complete. Trust me when I say, they can pose real threat to the famous Bollywood couple Raj and Simran from DDLJ. 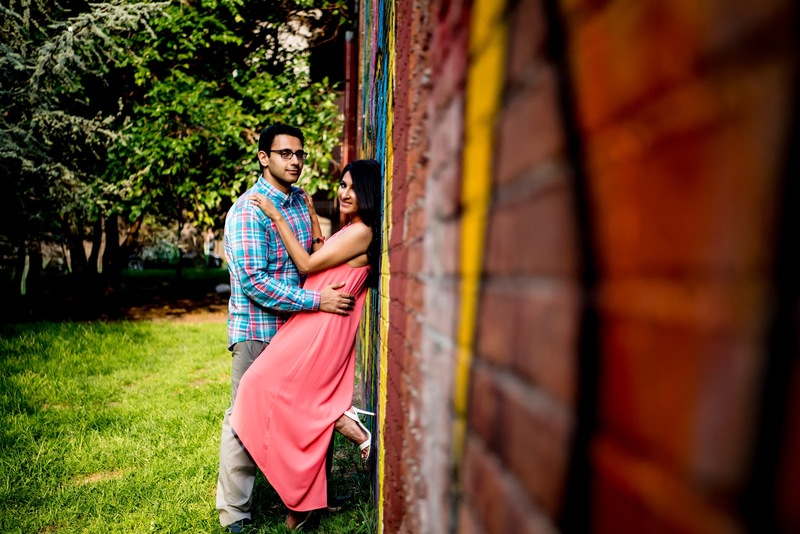 Pooja is one of those hands on brides who is not scared to work to achieve her goal of the perfect wedding. 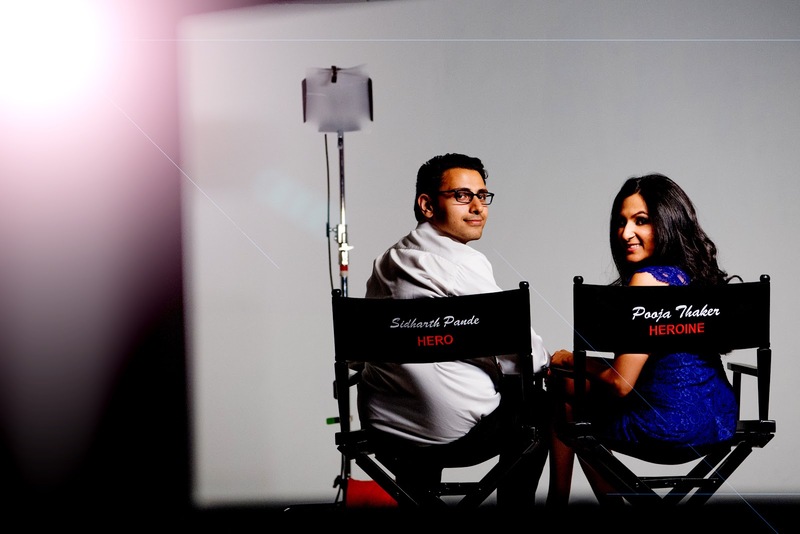 In Pooja’s words “I have known this to be the theme ever since I became introduced to the world of Bollywood. When planning the wedding events, the challenge for me was to incorporate the theme without making the event tacky or loud. So we began with the Save the Dates, where we decided to reenact some famous Hindi movies using a green screen. For the shoot we didn’t want to repeat the same idea, and I really wanted to do something no couple has ever done before. So, being an ardent follower of Filmfare, Vogue India, Harper’s Bazaar Bride India, I came up with concept of doing a magazine shoot for the premiere of our wedding — our movie: “Pooja Weds Sidharth.” To really give the feel of premiere shoot, I came up with the idea of doing part of our engagement shoot in a film studio with the classic white screen, a vanity mirror, and big studio lights.” With our hero and heroine ready, the studio lights set up and with Pooja’s sister Payal wearing different hats (sometimes she was the make up artist, sometime the clap stick girl) everything just fell right in place. 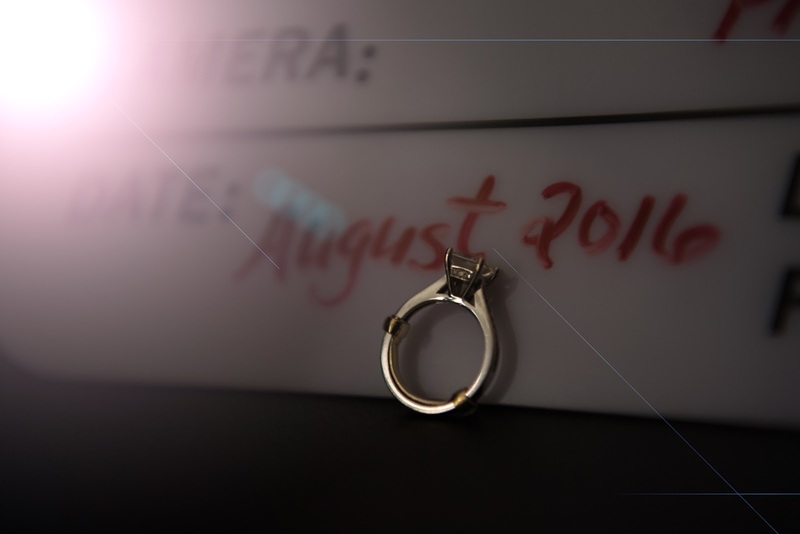 The engagement ring placed on the name covers added its sparkle and tied the couple to another Bollywood movie. 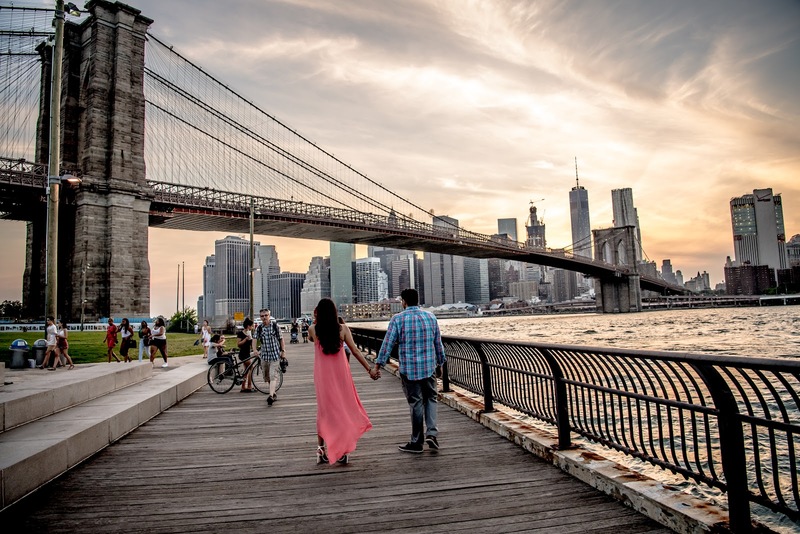 The second half of the shoot acted a bridge between Bollywood and our favorite city of New York. 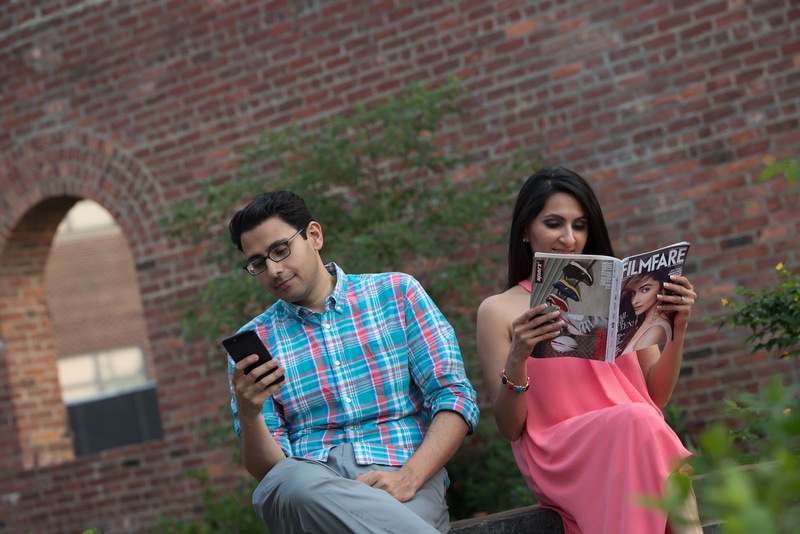 The bride and from engrossed in the famous Filmfare Magazine in front of the Graffiti walls in Dumbo Brooklyn will be one of our all time favorite out of the box photo. 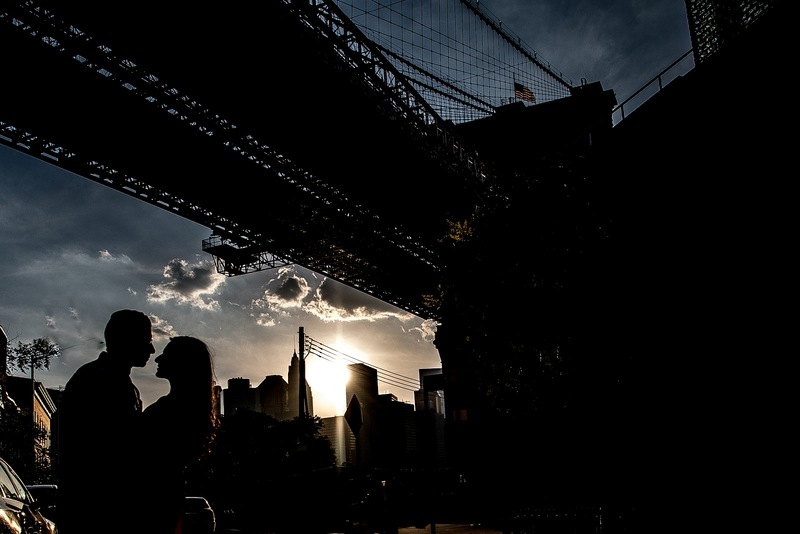 The Brooklyn Bridge added the elegance to the shots. Since Pooja and Sid wanted a Bollywood themed wedding, they incorporated these photos in the welcome booklet outlining the wedding events at their wedding..Needless to say it looked like a Filmfare Magazine celebrating the premiere of their wedding :). I chose PhotosMadeEzdeEz, because I wanted a photographer who thinks out of the box and who is not afraid to take those crazy shots. At the same time I wanted someone who was open to my ideas and vision. I found both of these qualities in PhotosMadeEz. Mou never shied away from doing something new, and that’s what I loved about her”. Thank you Pooja. 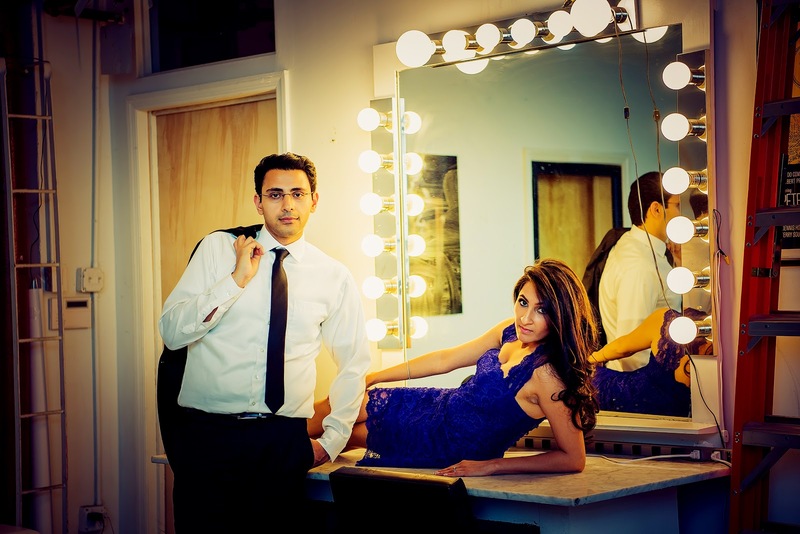 And a big thanks to South Asian Bride Magazine for featuring this amazing Engagement Session. All these pictures and out-of-the-box scenarios paved the way for the Big Picture ie. the couple’s forthcoming wedding in full Bollywood style. And as the famous dialogue goes, Picture Abhi Baki Hai Mere Dost ;). PS: If you think this is amazing wait till you see the Wedding.